Some would say that any marketing campaign that gets headlines and publicity is worth its weight in gold. There’s no such thing as bad publicity the expression goes. When RIM Australia decided it was time to shake the cage they chose a rather loud, direct and disturbing way of doing it. A few days ago a mob of people walked off a black bus in front of the Sydney flagship Apple store, dressed mainly in black with black signs in white writing saying “Wake up”. This was followed by some chanting of those two words, over, and over, and over, and over again. (In case you couldn’t read or somehow missed the 40 odd people standing on the footpath in front of you). They then meandered down the city streets in much the same vein. Finding this hard to believe? There’s a YouTube clip for that. The YouTube clip appears to be genuinely unrehearsed and spontaneous and with a busy Apple Store there’s no doubt that someone would have caught the mock protest on film. If anything I’m surprised it was just one person that posted it online. In any case marketing of this nature has been an ebbing/flowing trend over the past few decades where by some cryptic or partial message is pasted everywhere within sight and then people remember it by pondering - I wonder what that means? Then, days, weeks or even months later the public relations machine reveals what it meant and what product or service they are trying desperately to flog off. I’m not a marketer and have no idea if this sort of advertising is effective in general but to look at the Apple Store “protest” in isolation you do have to wonder what their goal was. If it was to raise awareness of their “secret/reveal” but protesting in front of a huge Apple Store that would definitely get attention and in that way many people would wonder about it and it got their attention. However what did the marketing geniuses believe people would think of a company when it was revealed the way they advertise a new product/service was to yell at people buying the oppositions product literally to their faces? It’s common enough in most industries to poke fun or even insult competitors but to do that to the customers that you are trying to win over seems a bit stupid. There are three broad categories of people that witnessed the ‘protest’: either directly or via the news/YouTube. 1) Apple lovers. They will shake their head at RIM and chuckle at such a sad marketing tactic. 2) RIM lovers. They will nod and agree - ‘Apple users should Wake Up that’s true!’ and they will still be buying a RIM device irrespective of whether the ‘protest’ ever happened. 3A) That were in the Apple Store at the time: Presumably they were in the Apple Store to look at or buy an Apple product. (Yes, okay they could have been returning a defective product too). If I choose to be in an Apple Store, other people yelling at me telling me to wake up suggests that they think I’m stupid or brainwashed. Either presumption and I’ll dig my heels in and openly oppose whatever the heck they think they’re selling to me. 3B) They weren’t in the Apple Store but have enough interest in Apple to note that someone on the news/across the street was yelling at Apple: Target audience. Although no-one can predict the proportions of people in the above categories I’d guess that RIM has offended more people than it has enticed by its marketing tactics. In the end the Wake Up ‘Protest’ made headlines, but the long-term fallout is likely to be worse than any possible interest the stunt could ever have gained. RIM continues to make such bold predictions for their new products (refer image) but have consistently failed to capture interest in the current market. The general public are tired of the Blackberry and are switching to Android and iOS in droves. 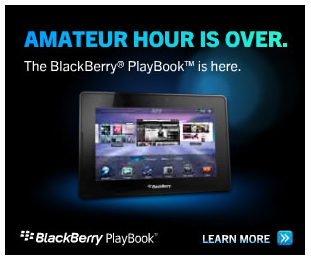 A stupid marketing campaign where RIM paid people to yell at Apple won’t help them achieve much if anything at all.